Last fall, I helped my father-in-law cut down some apple and peach trees he had grown tired of obsessing over. I brought some of the stumps and better looking limbs home to dry and put to good use in my shop. Unfortunately, like a lot of stray things I bring home, I didn't really have space to properly store the logs while they dried. 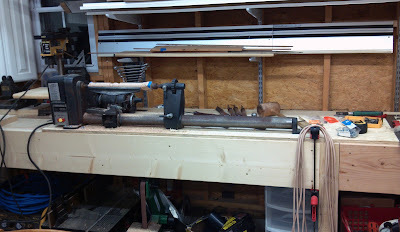 The fruit wood sat behind the garage like Blackbeard's treasure being beaten by the elements until the day I finally mounted the motor for the lathe. Originally, I wanted to cut veneer from these logs to use in hope chests (either drawer fronts or inlay) for my father-in-law's 3 granddaughters (including my daughter). This plan is still in the works as there is another, much older, apple tree he has considered felling. 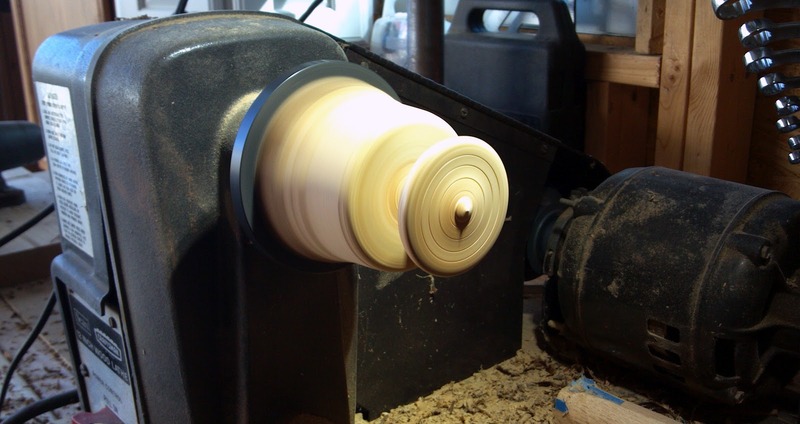 The limbs in my possession were rather small, so I picked a couple of the better looking ones and chucked them into the lathe. 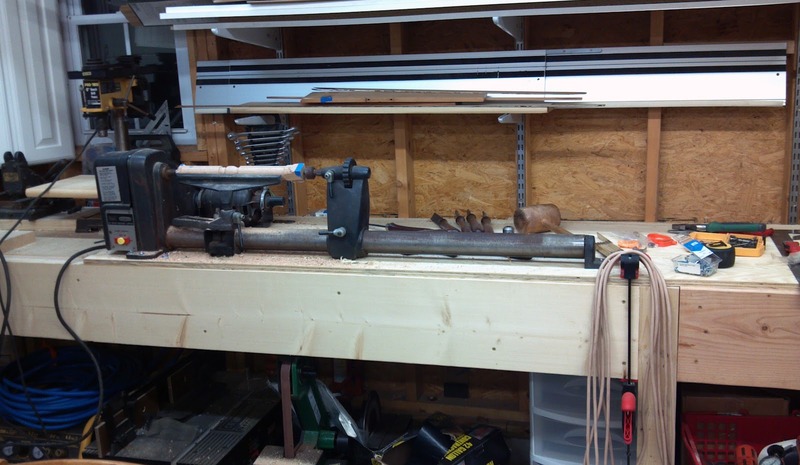 I mounted the lathe and motor to a piece of appropriately sized 3/4" plywood. It is light enough that I can store it under the bench when I am not using it and sturdy enough that it doesn't vibrate in the least once its clamped to the bench. I am really liking this modular setup so far as it makes this bench a power tool "swiss army knife." It also works well with a lot of my hand tools for basic tasks. It is a little high for planing but for sawing and chisel work it works well. I am, however, getting more excited about constructing my roubo (very soon I promise) as it will be accessible from all sides, be a better height for planing and have some better clamping options. 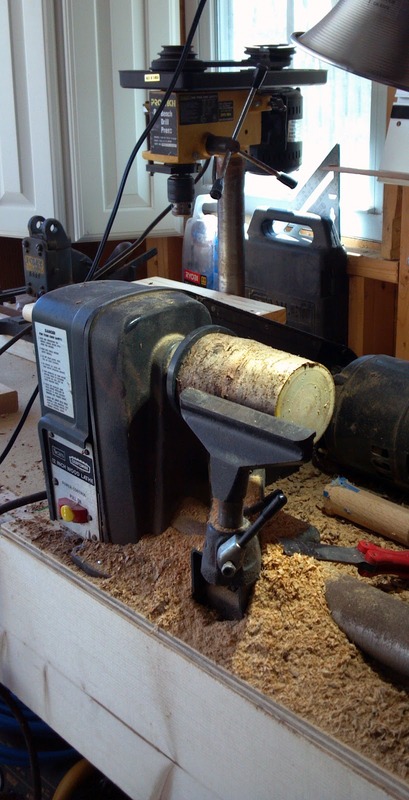 The New Monster Workbench With Lathe "Attachment"
The fruit wood turned beautifully, had great figure, and even some spalting that really made it something special. 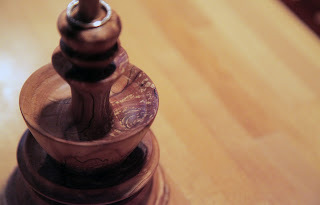 I turned four toy tops for the grandchildren and several ring holders for the grown up ladies in the family. I thought the choice of wood was appropriate as my wife and her sister had grown up with the trees. Some of the early test pieces did have some issues with splitting as they were not initially dried properly. By adjusting thicknesses around the pith I was able to reduce a lot of the splitting issues. I'd always recommend a dust mask when turning, especially with wood that has spalting as it can contain allergens and other microbial beasties that may cause some serious internal irritations. 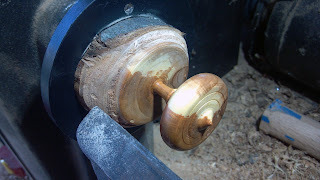 Additional care had to be taken as some of the wood was a bit punky, causing it to blow out on the lathe occasionally. The occasional blowout caused for much frustration and gnashing of teeth, but in the end I was able to gather a small group of decent gifts for people I care about. Some of the other limbs may become tool handles or saw totes as the wood is exceptionally hard and finishes beautifully. I finished the tops and ring holders with a food safe beeswax finish after a treatment with 220 grit sandpaper and a light touch with a paper bag to polish. The ring holders also got a treatment with several coats of wipe-on poly under the beeswax to protect against any infiltrating water from wet hands. 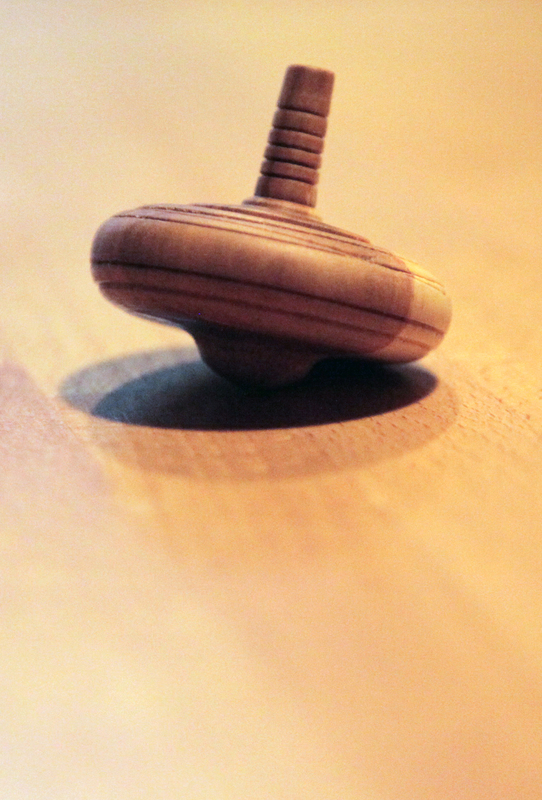 All were received well, as the wood had some meaning to all its recipients. Meaningful materials can often mean more than the object itself with gifts like these, which is lucky for me as my turning skills leave a lot to be desired.